All of the female Democratic senators signed a secret letter to Hillary Rodham Clinton early this year encouraging her to run for president in 2016 - a letter that includes the signature of Sen. Elizabeth Warren and other senators who are mentioned as potential candidates, two high-ranking Democratic Senate aides told ABC News. "All of the Senate Democratic women have written her a letter encouraging her to run," Hagan told a gathering organized by EMILY's List, according to Capital New York. The event was part of the group's "Madam President" series, which is organizing events around the country to promote interest in a female Democratic presidential candidate. Hagan's office did not return calls seeking comment. Clinton aides also did not respond to requests for comment. "I have repeatedly said - publicly, privately and in writing - that Hillary Clinton should run for president in 2016," Boxer said. "I can only speak for myself. I'll leave it to my colleagues to describe their views." The actual letter has still not emerged publicly. But its existence adds momentum to the growing sense of inevitability around a Clinton candidacy in 2016. It would also appear to take some of the biggest potential Clinton rivals out of the 2016 mix. Warren, D-Mass., has been widely mentioned as a possible liberal alternative to Clinton in Democratic primaries. While she has denied interest in running, this letter goes further than she's gone previously in supporting a Clinton candidacy. Other potential presidential candidates, such as Sen. Amy Klobuchar, D-Minn., and Sen. Kirsten Gillibrand, D-N.Y., are Clinton supporters who are widely assumed to be ready to forego bids of their own if Clinton runs. This letter would seem to confirm the sense that other Democratic women - and perhaps all other major Democrats - would get out of the way of a Clinton candidacy. Some of Clinton's biggest public boosters are her former colleagues. Aside from Boxer, Sen. Claire McCaskill, D-Mo., has been publicly urging Clinton to run for months now. McCaskill, who famously endorsed President Obama during Clinton's 2008 presidential campaign, has aligned herself with the Ready for Hillary PAC and has also been active in the EMILY's List "Madam President" series. In a post-election interview with 19 of the 20 female senators - including 15 of the 16 Democrats - Sen. Kelly Ayotte, R-N.H., shared a story about her 8-year-old daughter saying she didn't want her mother to run for president because she wanted to be the first female president. "Well, she better call Hillary," Boxer quipped. 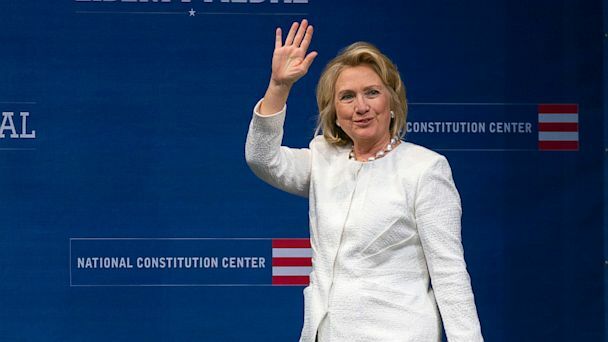 Clinton has remained mum on the public stage about a possible candidacy, and has indicated that she would not make up her mind until at least next year.